One day, A group of people came and started cutting trees and building houses. There was no left home for the Pokemons. The Trevenant did not know what to do so it ask help on the Harvest Goddess. Harvest Goddess quickly responds and tried to punish the people. But she fell in love with one of them, and his name was Eric, which also fell in love with her. So Harvest Goddess forgave Eric and his townspeople. Trevenant didn’t like her decision but he doesn’t have any choice until he learned that If Harvest Goddess marries a human, she will lost all of her powers and pass it to Trevenant that’s one thing Harvest Goddess didn’t know about herself. Until 2 years later they got married (That’s a long wait, huh?). At the end of the wedding, Harvest Goddess tried to use her powers to create fireworks but it didn’t work, that’s the time when she realized she lost all of her powers but she accepted it because she is happy with her husband. Trevenant is wondering why he still don’t have Harvest Goddess’ powers so he asked Kappa, Harvest Goddess’ brother. Kappa said that he will only obtain Harvest Goddess’ powers at the birth of the Harvest Baby. (Kappa didn’t know about Trevenant’s plan yet). 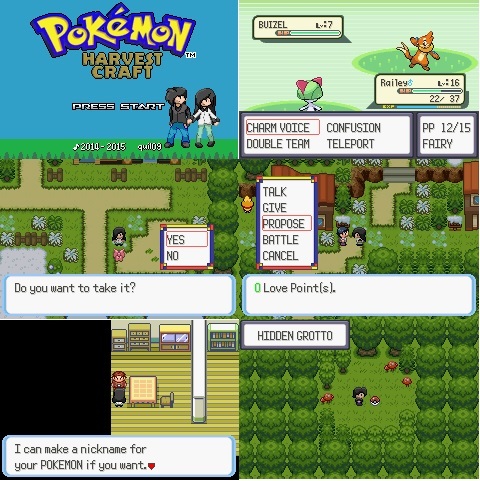 One day, Kappa manage to find out Trevenant’s plan, to trap the people inside the town and to kill the Harvest Baby so he tried to stop him but he failed. Kappa was trap inside a mine. Kappa told Trevenant that someone can stop him. You’re an 21 year old who’s just starting out on your journey but suddenly you got trapped in the town by Trevenant just for fun. Did he made a very bad thing to trap you in the town too? Can you stop this nonsense and free the townspeople? It sometimes rains every Spring, Summer and Fall and sometimes snows every Winter. Weather affects the energy lost when you do work. Time changes only if you go through Maps. NPCs move around the town depending on time and day. Seasons changes every 30 days. Changing Season affects the items found and wild Pokemons encounter in the Woods. You can plant Apricorns any season except Winter. Up to 6 Apricorns can only be planted. Berries found regrow everyday by random. Shop Owners give you badges when you defeat them and Trevenant will serve as the Champions battle. Some Pokemons from Gen 4 to Gen 6 (May not have the correct Cry, Movesets, and Method of Evolution). Cooking food to replenish Your Energy and Your Pokemon’s Health. Crafting tools to help you on your work. Such as foods, apricorns, and other resources. Energy decreases when doing work. You can replenish your Energy by eating or sleeping. Maximum Energy gained when you sleep is determined by the number of badges. Fairy Type Pokemons and Moves. New moves doesn’t have new animations or effects. Just some animations that I think it will suit them.